The scenery and cliff walks at Harlyn Bay are breathtaking. 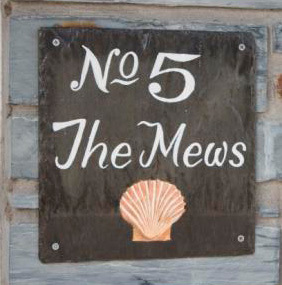 No 5 The Mews, Harlyn Bay, Padstow, Cornwall, is a delightful modern cottage offering 4 star self catering and accommodation for 6 people. The dog-friendly cottage is a 2 minute flat walk away from the breathtaking Harlyn Bay beach. The cottage is privately owned by Teresa and David Heritage and is situated in a small complex of holiday cottages in the grounds of the Harlyn Inn. The cottage's location is one of its main appeals as it's not just the beach that's close; nearby St Merryn has a lovely bakery, garage, fish and chip shop, newsagent Post Office and two small supermarkets also Padstow, with its shops, including a large Tesco, is only ten minutes drive away. With 3 good sized bedrooms, our cottage at No.5 makes a great holiday home for families or surfers that want a little luxury after a day on the beach. We offer 2 double bedrooms and one bedroom with bunk beds. The master bedroom has en suite facilities and there's a family sized bathroom too. Padstow is just a 10 minute drive away so, even when the thought of self catering doesn't appeal, Padstow's restaurants, bars and fine dining are just a short drive away. Harlyn Bay is wonderfully positioned for those who enjoy the north Cornwall coast and our cottage is particularly favoured by walkers keen to explore the nearby coastal paths. We warmly welcome guests with dogs, Harlyn beach is a year-round dog friendly beach and even the most energetic of four footed friends will enjoy the large safe beach. When the surf's up surfers don't need to live in the back of a van as the 4 star cottage is just 2 minutes from the beach. For those of you who have never surfed before but have always fancied it, Harlyn Bay is home to the Harlyn Bay Surf School - so what better place in Cornwall to learn to surf? Harlyn Bay is a large, sheltered and safe sandy beach on the north coast of Cornwall. During the summer months lifeguards are on duty as is the case at other nearby beaches in the area: Treyarnon, Constantine, Booby's Bay and Trevone, which are all renowned for their great surf and yellow sand. Harlyn Bay is a great holiday destination for families, couple and single travellers. Harlyn beach is a dog friendly beach and, with the surrounding area, offers a wealth of activities and opportunities for all: walking, surfing, fishing, sandcastle building, horse riding, golf and cycling. Harlyn Bay is not only a summertime fun location but offers many experiences in the quieter out-of-season periods particularly walking, golf,solitude, spectacular scenery as well as surfing for the more hardy. The scenery and cliff walks at Harlyn Bay are breathtaking so make sure that you take your camera with you on the coastal walks or cycle rides. The South West Coastal path passes just yards away from the front door of the cottage. The path lets walkers explore the outstanding Cornish coastline and is widely regarded as the jewel in the crown of all walking trails in the UK. For a wonderful day out, take the ferry from Padstow to Rock and follow the Camel Estuary to its mouth via the sand dunes and beaches or by walking along the low cliffs. Traverse across Polzeath Beach and follow the cliff to Pentyre Point - on a sunny day you can enjoy the unspoiled beauty of the surf breaking at Polzeath, the Estuary snaking up towards Padstow and the unique beaches to the west of the Estuary, sheltered by Stepper Point. Come rain or shine and no matter what age or ability, a holiday based at Harlyn Bay Cottage offers something for everyone.